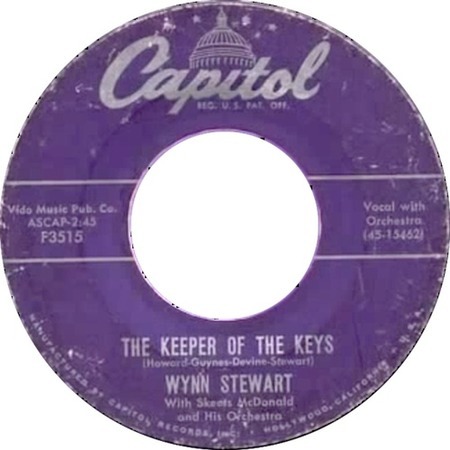 Wynn Stewart began recording in 1954 for the Intro label. By 1956 he had moved to Capitol, where he recorded "The Keeper Of The Keys," a number he had helped to write. The recording was released on Capitol F3515 15462. This is the same song sung during the so-called Million Dollar Quartet Session and listed on most (all?) releases as simply "Keeper Of The Key." (Elvis sings only background vocals on this number, the lead being taken by Carl Perkins.) The B-side of Stewart's original release contained a number called "Slowly But Surely," but this is not the same number as the song of the same name recorded in May 1963 by Elvis. Wynn Stewart died in 1985.